Do you have any idea what the latest rage in transportation is? No, it’s not autonomous cars, although aren’t they super cool?!? Neither is it electric vehicles, not as cool as autonomous cars, electric cars are still pretty cool. However, you’re on the right track, this impressive new form of transportation that has consumers everywhere awestruck does use “green energy”. The latest craze in personal transportation that has the whole country amazed, and clamoring to retailers for their own latest and greatest mode of transportation is none other than a Balance Bike from PUBLIC Bikes. These awesome Balance Bikes are produced in San Francisco, California, by PUBLIC. PUBLIC also designs and sells urban bikes and accessories including baskets and bags. Most people will think “it’s only a bike without pedals, what’s the big deal?” This is a valid thought until you consider the thinking behind the bike’s design. Balance bikes are safer and more practical because the focus of the bike is on balancing. This makes first time bike riders more prepared for the unexpected loss of balances, which happens often in the beginning. This makes children less likely to fall and more likely to be able to correct their balance in the event this happens. The new Balance bikes aren’t an expensive fad. They are actually more economical then going the normal route with their children’s bikes. Normally, we buy our kids a tricycle to start out, then a 12” bike with training wheels, then we take the training wheels off that and when our child grows out of that bike (which is quickly) we buy them a “regular” bike. 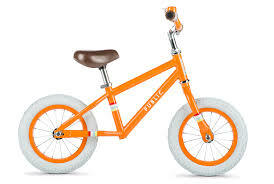 With the Balance Bike you can eliminate the tricycle and the 12” bike all together because they’re no longer needed. Tricycles have a tendency to flip over when the front wheel is turned and blocked. The 12” bikes are a waste of money because children outgrow them quickly and they don’t really teach balance they are only a crutch that prolongs the need to learn balance. Where as the Balance bike teaches balance and when your child outgrows it, they are immediately prepared to move right to a “regular” bike. Another advantage to the Balance bike is there isn’t a chain to get caught up in. Getting caught in the chain has always been a problem for new bike riders. It’s always been very easy to get your pant leg caught in your bike’s chain especially for kids whole are new to bike riding. When you get caught in the chain you will usually wind up flipping over, usually at a high rate of speed. It doesn’t matter if your bike has training wheels or not, you’re child is going to tumble. No chain, nothing to get your pant leg caught in, no crash it’s as simple as that. Bike riding is an excellent way remain healthy while getting around. Obviously, beginner bike riders aren’t going to get a whole lot of exercise without pedals to pump, however, we all have to start somewhere and this bike’s ingenious new design is an excellent way to learn how to safely and properly balance yourself on a bike. I’ve always thought of training wheels as a crutch, however, I never really saw a way to improve on this concept. This idea is honestly ingenious because, for the many reason, it focuses on the task of balancing and nothing else. Balancing is arguably the most important task to learn in bike riding. Without proper balancing I think the outcome is pretty obvious. Not only is the best balance bike available on the market it’s also the best quality. From the quality constitution to the design PUBLIC has always been well known for their quality bikes and bike accessories. Along with the quality construction of these bikes is the attention to detail and design. These are all great looking bikes that will make any child proud to own and ride it but also more interested in as well for a well focused interest.